Thousands have gathered in Algeria’s capital to demand the immediate resignation of President Abdelaziz Bouteflika despite him dropping his bid for a fifth term. The BBC’s Mohamed Arezki Himeur in Algiers says it is the biggest protest in memory, with people of all ages packing out the capital’s boulevards. Police have fired tear gas at protesters near the president’s office. On Monday, the president postponed the planned 18 April presidential vote. Protesters, however, accuse the 82-year-old leader of illegally extending his term. Students have been leading the massive anti-Bouteflika protests which have entered a fifth week. Our reporter says that the latest demonstrations included many families in what has generally been a peaceful and good-natured atmosphere. The ailing octogenarian rarely appears in public and has not given a public address since having a stroke in 2013. He returned to the country earlier this week after being admitted in hospital in Switzerland. Half of Algeria’s population is under the age of 30 and youth unemployment has spurred anger against the government. The appointment of new Prime Minister Noueddine Bedoui and plans to form an inclusive government have failed to assuage the protesters. 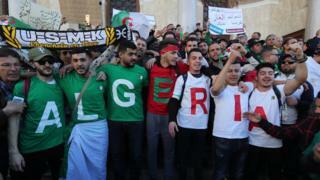 They have dismissed Mr Bedoui’s plan to form a technocratic government that would include young Algerians. Media captionAlgeria protests: What’s behind them? He said, in his first press conference on Thursday, that the new government would only be in charge for a short time and he urged the opposition to engage in a positive dialogue. 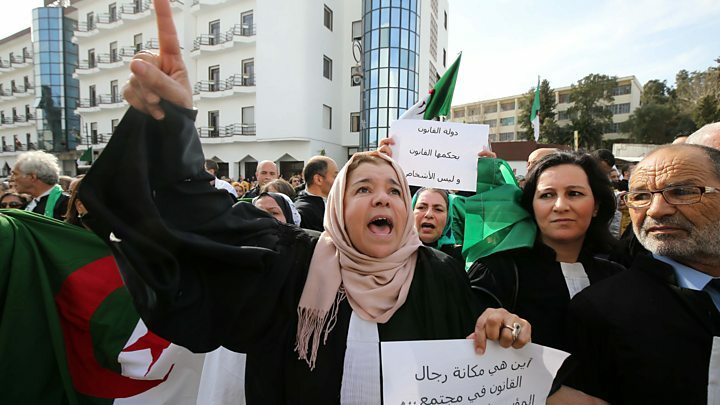 President Bouteflika’s announcement on Monday that he was dropping his plan to run in elections that would extend his 20-year rule, was initially greeted by celebration but activists now see it as a ploy for the National Liberation Front to hold on to power. Friday’s demonstrators have gathered at Algiers’ landmark Grand Poste square and have also been chanting against French President Emmanuel Macron who has called for a reasonable transition. “Macron, go away” they chanted, while hoisting banners with the same slogan. Talks have been set up to negotiate Algeria’s political future, which will be led by veteran UN diplomat Lakhdar Brahimi. A conference, which does not yet have a set date, will aim to oversee the country’s political transition, draft a new constitution and set the date for elections. Mr Brahimi, who was the United Nations and Arab League Special Envoy to Syria until 14 May 2014, met the president on Monday and said it was necessary to “turn this crisis into a constructive process”. The Algerian military is expected to play an important role in the transition and is currently considering contenders for president, Reuters news agency reports. Demonstrators and participants in Algeria’s 1954-1962 independence war will also be among the representatives at the conference.